Mumbled and garbled audio aside, the atmosphere in Exeter was electric. The Bow student section was in place early. The Windham throngs seemed to show up at exactly the same time. Keene packed their side with orange and black. St. Thomas showed their various blues. Before long the seats were full. The areas all around the glass where people were allowed to stand, were accounted for. The crowds for all of the Final Four teams were loud, present, and noticeable. Despite my hometown Grizzlies being absent from the semifinals, it was fun to watch some good high school hockey. Storylines run in every direction when there are a few of us, or more, gathered at events like these. Then, there comes the time when the game is played, and legends are born. The Bow Falcons and Windham Jaguars not only met in last year’s Division II State Championship Game (Won by Windham 4-3), but they already played twice this season as well. In the space of 3 days Bow beat Windham 2-1 at home, and then tied Windham 0-0 at their place. So, when #2 Bow (16-2-1) took the ice against #3 Windham (13-6-1) in the evening’s first semifinal, there was a lot of familiarity between these teams. In some sort of gamesmanship, or slight oversight, the Bow Falcons and Windham Jaguars skated for nearly 7 minutes of the 10 minutes allotted for pre-game warm-up, without pucks. It was mildly odd, but both teams looked warm. To the game! It was pretty obvious that the Jaguars were not the least bit intimidated by the high-flying Falcons. This was a case of two teams that just match up well with each other. As a matter of fact, it was Windham that set the standard in the opening period. Nolan Cunningham came out at top speed for Windham. This young man can skate, as I have been telling people for a few seasons now. At 1:39 Cunningham broke free, raced into the offensive zone on the right-wing side and ripped a shot that beat Nate Carrier in net, only to see (and hear) the shot clang loudly off of the post. Cunningham was probably Windham’s best player on the night. If he wasn’t their best, then it was goaltender, Max Daly. Daly made an absolutely sensational save at 5:29 of the period when he dove from right to left to pilfer a shot off of Chris Mead’s stick that was labeled for the back of the net, while Bow was on their vaunted power play. Which brings me to Bow. Chris Mead was a man among boys for most of this game. He was outstanding with the puck, and a constant threat to score just about every time he was on the ice. I thought that he was Bow’s best player all day, if it wasn’t the ever-present, Mr. Everything, Colin Tracy. Nate Carrier made a huge save on a Tim Anderson bid at 6:18 to keep the game scoreless. The first period would remain tied, 0-0, with Windham getting 6 shots on goal to Bow’s 5. Windham took the only penalty in the period. In the second period, play was pretty even again, and Bow’s team speed still had not been a real factor in the game. Windham had been getting more of the odd-man rushes or at least the quick breaks into the Bow zone. At 6:58 of the middle period Chris Mead finally beat Daly with a shot off of a rebound in front of the net. Bow had possessed the puck in the offensive zone for an entire shift, and Mead cashed in, with assists going to Doug Champagne (2016 Player of the Year) and Austen Skarinza. After Bow scored, this (“On the rocks”) line of Champagne, Mead, and Skarinza, kept turning up the pressure. Windham would take two more penalties in the second half of the period, but thanks to team defense and Max Daly, they kept Bow off of the scoreboard. After two periods, Bow led 1-0, while Windham held a 13-12 advantage in shots on goal. In the third period, the Falcons really got their legs going. They would end up dominating the shots game, 12-3 in the period. Bow all but shut Windham down, allowing almost nothing to get through to Carrier in net. Daly robbed Colin Tracy with a gorgeous save at 3:29. The barrage was on, but Max Daly stopped every shot he saw, well except for one. Doug Champagne finally found some open space and rifled a shot past Daly only to see that bid clank off of the iron, and away. Bow’s Brendan Ulrich made a beautiful pass to Chris Mead who walked in nearly alone before Daly made another huge save for the Jaguars at 6:37. Windham was not getting any chances, Bow was starting to swarm the offensive zone, and the Jaguars frustrations started to surface more and more by the shift. Jake Aleksa dropped a Falcon player with a vicious cross-check from behind and went to the sin bin. Windham took two more penalties before the game was over, and probably were fortunate to get out-of-town without getting another half-dozen. To Windham’s credit, they somehow kept Bow from scoring on the power play. With 3:07 to play, Windham’s Matt Crowley turned the puck over at his own blue line, when Champagne picked his pocket. Champagne sprinted to the net only to be turned away by Max Daly. With 1:00 remaining, Windham had to pull Daly to get the extra attacker on the ice. Then, at 14:28 of the final period, Bow’s Alex Killion took the puck from Windham’s Owen McNamara and scored into the empty net. Final score, Bow 2: Windham 0. Bow heads to the Division II State Championship game for the 3rd time in 4 years, looking for their second hockey title (2010). The Falcons did out shoot the Jaguars 24-16 in the game. Bow held Windham to just 1 goal scored in 143 minutes of hockey played head-to-head this season. Goal scoring was a major bugaboo for Windham this season, who finished the season at 13-7-1. Bow improved to 17-2-1, and will play for the Championship on Saturday at 2:30pm at SNHU Arena. Windham: Max Daly 22 of 23 shots. Bow: Nate Carrier 16 of 16 shots. So, what do you get when you put a BlackBird and a Saint together in a small space? Well, first a lot of tension, an element of surprise, and ultimately, the Saint prays, and the BlackBird flies. #1 Keene (17-0-0) entered the second semifinal of the evening as the overwhelming favorite against the undersized, overachieving, #5 St. Thomas Saints (12-7). Keene carried the weight of the undefeated season on their backs, while attempting to be the first team in BlackBird history to play in a hockey final. St. Thomas came into the action having won 8 straight games against Division II opponents. Something had to give, right? The first period looked like it was going to be a runaway in favor of Keene, except for one problem; nobody told St. Thomas goaltender, Chris Eno. According to the scorer, St. Thomas did not register a single shot on goal in the opening period. Somehow though, they were still in the game after 15 minutes, even with Nathanael Darwin, Gaetano DeLonge, and Tim Greenwood (the extremely potent DDT line) clicking on all cylinders. Just 1:48 into the contest, DeLonge fed Greenwood with a pass, that Greenwood bested with an even better pass to Darwin who was wide open in front of the net. Bing-Bang-Theft! Chris Eno made a ridiculous save on Darwin’s launched assault. Keene got more shots, Eno made more saves. Then the game’s two best players were at it again, when DeLonge made a brilliant pass to Darwin who buried the shot, giving Keene a 1-0 lead at 7:08 of the first. Then, shortly thereafter, just to tempt fate, St. Thomas was called for a penalty when Eric Keilty was whistled for interference. Hunter Gallant, and Keene scored what appeared to be a power play goal at 10:05, but the goal was immediately, and emphatically waved off by the official behind the net. As a crossing pass slid across the crease to perfectly positioned Gallant, St. Thomas had knocked the near side post off of it’s perch, thus the goal was waved off. The post made no difference in the outcome of the play, and the defending team was the guilty party, but it was called; No Goal! A minute later the slick skating, silky skilled, Gaetano DeLonge ripped a shot past Eno in net, but the puck met the intersection of iron I call the “crosspost”. It made a lot of noise but the puck caromed harmlessly away. The score remained 1-0 after one period. The second period started the same way that some Goffstown fans (me included) are still seeing in their hockey nightmares. St. Thomas came out and took their game to a higher level. Keene can say they were ready for it, but they weren’t. It was clear, the first ten minutes of the middle period were spent chasing the speedy Saints forwards. It took just 12 seconds for the Saints to tie the game. Eric Keilty netted a shot that looked like it surprised Myles Ditkoff in goal. Keilty tied it at 1-1, with the assist going to Baxter Kimball. Then the line that drove Goffstown crazy, JoJo Grella with Paddy Vetter and Matt MacLean, got their legs going. I refer to them as the “JuMP” line. And man, can they skate. At 5:57 of the period, JoJo to Matt, over to Paddy, on the fly, save by Ditkoff. At 7:43, Eric Keilty broke in and fired a shot at point-blank range, but Myles Ditkoff was there again, save Ditkoff. The JuMP line blasted up ice again at 9:06 of the period, when JoJo Grella hit Matt MacLean with a lead pass before MacLean centered a pass to Paddy Vetter in the slot. There waiting, in position, with angles covered, was Ditkoff, taking the shot right in the chest, and denying a rebound. The game was still tied 1-1, and the mighty BlackBirds may have wondered if tonight was one of those nights, when Chris Eno robbed Jason Langevin on a rebound after St. Thomas had just killed a penalty seconds before. Garrett Downs had been called for holding and the power play seemed to get Keene going again. Just as quickly as that thought resonated though, there was JoJo to Matt, again, but also present was Mr. Ditkoff, again. The Keene netminder had made another huge save, this time, at 12:41 of the period. Little did anyone know then, that would be just about the last real scoring chance that St. Thomas would mount. After two periods, the game was tied, 1-1. Keene was out shooting the Saints, 19-10, but St. Thomas had made their run, and everyone in the building was not only surprised, but very well aware that the #5 seed was there, and they were for real. Senior captain, Jason Langevin was obviously not content with the way things were going through two periods. Just 34 seconds into the 3rd period, Langevin skated up the right-wing like he was shot out of a cannon after taking a pass from Griffin Kane. Langevin was a blur as he approached the net and sent a laser into the top of the net up under the crossbar on the top shelf where mom hides the good presents. Chris Eno had no chance on the play. Keene nation took a collective sigh of relief, as the weight they carted around The Rinks at Exeter suddenly seemed a little lighter. As if to make their path a bit more unpleasant, St. Thomas followed up by taking a tripping penalty on Matt MacLean just 17 seconds after the goal. Murmurs in the crowd predicted that this was it. It was over. However, to prolong the drama, St. Thomas killed the penalty. Much thanks to Chris Eno who calmly swiped a shot from Griffin Kane’s stick after being set up by Jason Langevin at 2:33. Later on the shift, Kane was whistled for charging, and the Saints went on the power play at 4:15. Keene killed off the penalty with relative ease, and everyone wondered if there would be another Saints’ surge. There was not. And it wasn’t because they weren’t making plays, but rather that, Keene had caught the smell of blood in the water after J-Lang had invigorated the Keene faithful early in the period. It was at 6:52 of the final stanza when we all saw Keene score a goal that showcased their offensive brilliance like few others would, or could. In my notepad, I wrote, simply, “gorgeous”. Gaetano DeLonge, who skates like the wind is always at his back, waltzed into the St. Thomas end on your typical 1-on-3 rush, if not a sightseeing trip of the offensive end, waiting for help to arrive. Seriously. Keene made a line change behind DeLonge while he skated with the puck behind Chris Eno in net. Somehow he found plenty of room to send a puck from the other side of the net, past the helpless defenders, to his wing-man, Nathanael Darwin skating between the circles. Darwin made a move to the inside, that left a St. Thomas defender sliding harmlessly away, as Darwin changed direction again, he pulled Eno off of the far post in desperation. Eno waited, but Darwin with the puck, was like a puppeteer playing with the strings. Eno tried but Darwin out-waited him, and ripped a clean shot that tickled the strings behind him. Keene led 3 to 1, on a brilliant goal scored by a pair of brilliant BlackBirds. The goal sent the orange and black into a raucous celebration that would have made Halloween proud. A few minutes later Hunter Gallant almost blew the roof off of the place with his rush on a breakaway but his shot narrowly missed the net. Just 56 seconds later, Gallant made amends when he scored the final goal of the night after taking a pass from Darwin, at 10:00 of the final period. Keene led, 4-1. Had there been a fat lady there, she would have sung right then and there, but she was missing, so they played the last 5 minutes. All in all, Keene needed just 5 shots in the period to net 3 goals, as their level of play climbed to heights that even Saints had to praise. St. Thomas managed 2 shots on goal, for a game total of 12, but showed the full house that they belonged. St. Thomas finished their season with a record of 12-8-0, losing to a D-II opponent for the first time since Feb. 1st. Keene, meanwhile, improved to 18-0-0, and advances to their first hockey Championship Game on Saturday at 2:30pm at SNHU Arena. St. Thomas: Chris Eno 20 of 24 shots. Keene: Myles Ditkoff 11 of 12 shots. St. Thomas: 0 for 1. This is where all the hockey articles begin. (C) 1inawesomewonder 2017. Two games, NHIAA’s Division II version of the Frozen Four, four plus hours, hundreds and hundreds of fans, dozens of signs, seven total goals, eleven total penalties, a “crosspost”, four good hockey teams, all added up to a wonderful evening of NH high school hockey. See you at the final, for #1 Keene vs. #2 Bow. The thoughts and opinions expressed here are those of the individual contributors, mostly mine, and do not necessarily reflect the views of the schools, coaches, players, or characters listed in any of these blog posts. Or, maybe they do, but you would have to ask them directly. Either way, “It’s a great day for hockey” ~ the late “Badger” Bob Johnson. 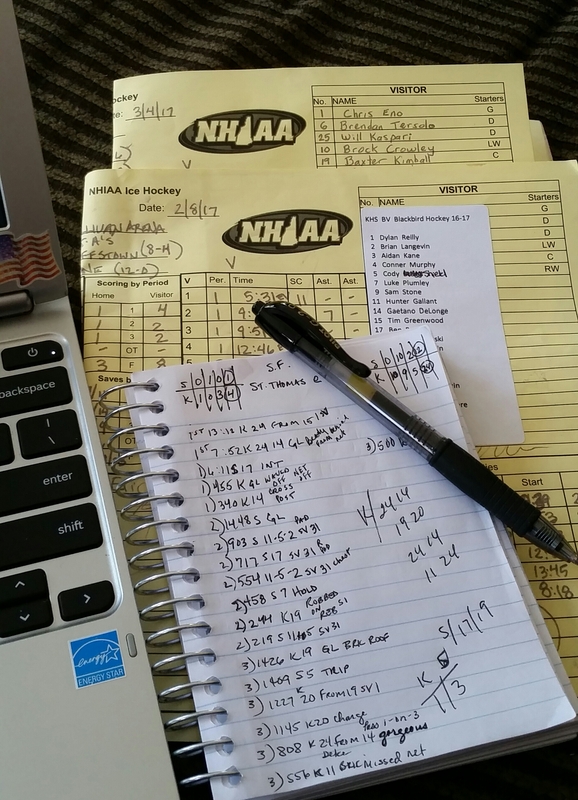 This entry was posted in Hockey, Sports and tagged 1inawesomewonder, @1inawesomewondr, @BowFalconsPuck, @KeeneBlkBrdHcky, @NHHSSports, @stalux, @WindhamAthletic, Beal blog, Bow hockey, breakaway, D-II hockey, Division II hockey, goal, Goaltender, hockey, Keene hockey, NH high school hockey, NH high school hockey coverage, NHIAA, NHIAA Hockey, saves, semifinals, shots, speed, St. Thomas hockey, SWBeal, the rinks at exeter, undefeated, Windham hockey. Bookmark the permalink.